A daily newsletter that captures what's driving the day in the nation's capital. Manchin (D-W.Va.) is underwater after posting 17 point slide — the largest drop of any senator. Tester (D-Mont.) vaults from bottom 10 to top 10 after a 16-point jump in approval. Sanders (I-Vt.) and McConnell (R-Ky.) remains the most popular and unpopular senators, respectively. 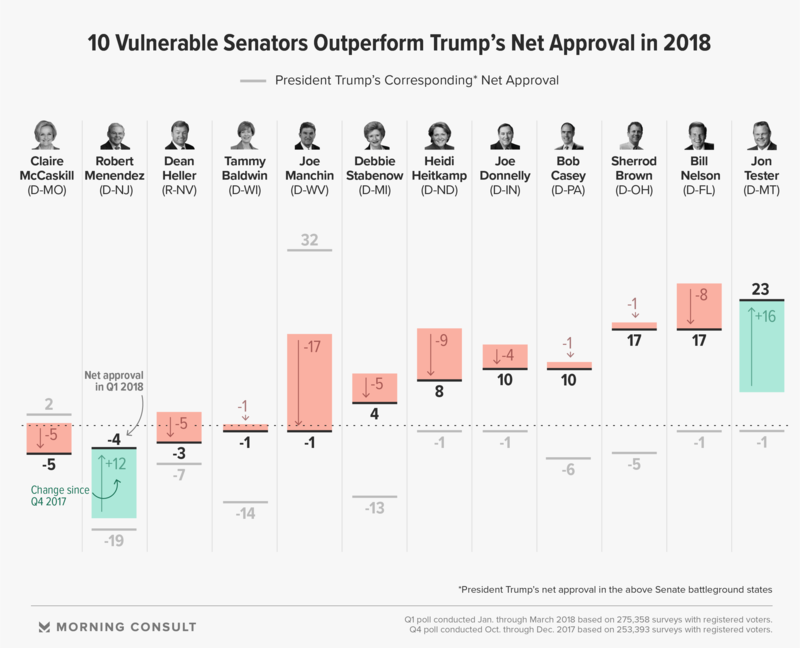 2018’s first quarter was a volatile one for several senators, with lawmakers on both sides of the aisle seeing significant changes in levels of support from their constituents, according to the latest Morning Consult Senator Approval Rankings. In the quarterly rankings — based on surveys conducted online with more than 275,000 registered voters nationwide from Jan. 1 through March 31 — a dozen senators saw their net approval ratings fluctuate by at least 9 percentage points from the previous three-month period. By comparison, two senators saw swings of that magnitude during the fourth quarter of 2017. See our methodology here. Four senators posted net increases of 10 points or greater last quarter. Vulnerable Sen. Jon Tester (D-Mont.) led the way with a 16 point increase, vaulting him from the bottom 10 to the top 10. Fifty-six percent of Montanans approve of Tester, compared with one-third who don’t. Sen. Bob Menendez (D-N.J.) also climbed out of the bottom 10 after a 12 point increase from the previous quarter. The Justice Department announced Jan. 31 that it was dropping its corruption case against the two-term incumbent, who’s up for re-election this year. Menendez had been a member of the bottom 10 for the previous three quarters. Sen. Bernie Sanders (I-Vt.) retained his spot atop the rankings after picking up 11 points from the previous quarter — 72 percent of registered voters in the Green Mountain State approve of his job performance. The most popular Republican in the chamber, Conference Chairman John Thune of South Dakota, gained 10 points. The Senate’s No. 3 Republican also ranks as the third-most popular senator, with 62 percent of constituents approving of his work. Net approval for Senate Majority Leader Mitch McConnell (R-Ky.) rose by 3 points in the first quarter, with 52 percent disapproving and 34 percent approving of his job performance. He remains the least popular senator. The eight senators with the biggest declines last quarter — a net drop of 9 points or more — are all Democrats. Sen. Heidi Heitkamp (D-N.D.) suffered a net decline of 9 points, though she still has the approval of 47 percent of her constituents, compared with Trump’s 48 percent quarterly approval rating among those voters. Hawaii’s Mazie Hirono and Brian Schatz each dropped 13 points, while New Mexico Sens. Martin Heinrich and Tom Udall fell 9 points and 10 points, respectively. Senate Minority Leader Chuck Schumer (N.Y.) and Sen. Tom Carper of Delaware also slid 9 points. Doug Jones (D-Ala.) shocked the country when he defeated Republican Roy Moore in the Dec. 12 special election to replace then-GOP Sen. Luther Strange — and he’s off to a fine start among voters in Alabama, where 47 percent approve of him and 25 percent disapprove. Jones is also more popular than Strange, who ended his 11-month Senate tenure with 42 percent of constituents approving of his job performance and 34 percent disapproving. The Senate’s other newcomer — Democrat Tina Smith of Minnesota, the former lieutenant governor who was sworn in Jan. 3 to replace Sen. Al Franken (D) — is relatively unknown among state voters, with 45 percent saying they don’t know or have no opinion of her. One-third approved of her job performance and 21 percent did not. Florida’s bipartisan delegation was dinged by constituents during the first quarter of 2018, which included the Feb. 14 shooting at Marjory Stoneman Douglas High School in Parkland that left 17 dead. Republican Sen. Marco Rubio’s net approval dipped 6 points, leaving him 4 points above water — 44 percent approve versus 40 percent disapprove. Democratic Sen. Bill Nelson, who is up for re-election, dropped 8 points to a net approval of 17 points. Term-limited Florida Gov. Rick Scott (R), who announced Monday that he will seek the GOP nomination to challenge Nelson in November, saw his net approval decline by 4 points during the quarter. Fifty-five percent of registered voters approve of his work as governor, compared with 33 percent who don’t.